I don't have a ‘whisky tasting room’, but for the serious (Bruichladdich) connoisseur the Anders Wirtén Bruichladdich Carpet might be of interest? Not sure how and where to buy it though, I can't seem to find ordering information on the site? After a quick search I also found a-carpet Bruichladdich where different colours seem to be available? The producer seems to be ACarpet from Sweden. All slightly confusing. With a name like ‘Ugly Betty’ it was bound to generate a bit of coverage and discussion, the old new (or should that be new old) fifth still just installed. 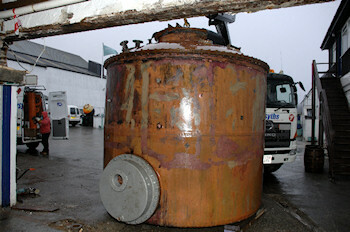 It is a ‘Lomond still’, rescued from the Inverleven distillery demolished in 2004 (the stills for the future Port Charlotte distillery also come from it). Distillery bosses resurrect 130-year-old still, Bruichladdich installs Lomond still, Quirky new toys at Bruichladdich, Bruichladdich, Cutty Sark, Glenrothes to pick some of the reactions. And the ‘Ugly Betty Valinch’ surely can't be far away, as someone suggested in the comments here. Ardbeg distillery had some new vats arriving and installed after taking a roof off, a few good pictures on Ron's blog. A series of dram fine views writes The Scotsman about the artist Ian Gray. Born in Scotland he now lives in Germany and mainly paints distilleries. Yes, he can make a living from it. Islay single malt whisky is quite popular in Sweden I believe, in particular with the Islay Maniacs (I believe mainly from the Göteborg area). If you understand Swedish you can read their diaries from 2006 to 2009 of their visits to Feis Ile. Otherwise you can at least look at the pictures and read the 2008 travelogue (as that's in English). Bonus link: It's not whisky, but then beer is a close relative: Islay Ales now has a fan page on Facebook. In the comments to this status update you'll find an interesting discussion why Islay Ales isn't sent to the US.